The Espada is both practical and tactical. 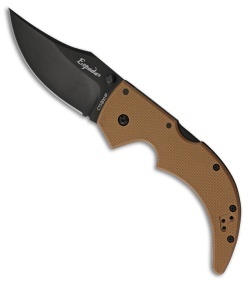 This medium model has a black finished blade, non-slip coyote brown G-10 handles, abbreviated steel liners, and Cold Steel's incomparable Tri-Ad Lock. If you have been lusting after one of the gorgeous Cold Steel Espadas, but find they are just out of your price range, look again. The G-10 models are almost identical where it really counts, and sell for a fraction of the cost of their much more expensive brothers.